19. "Russian woman on the beach by the Spa": Dead Sea. 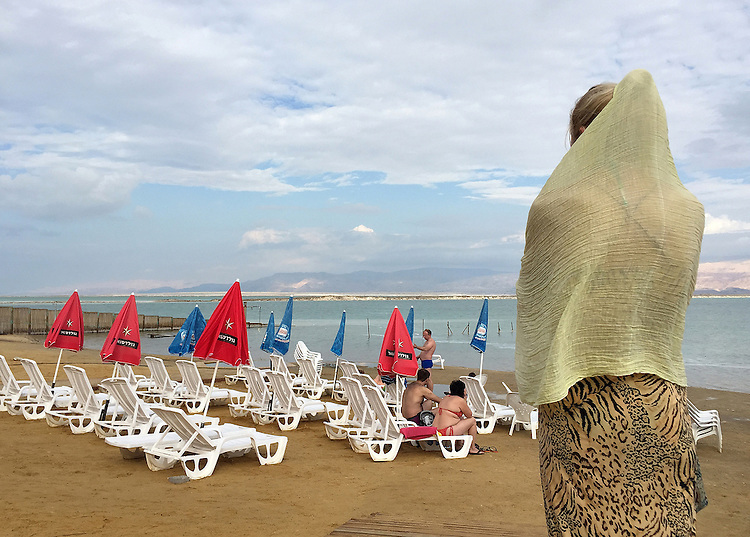 In her shawl and tiger-patterned skirt, this Russian woman seems out of place by the Dead Sea. Her shawl reminds me of a burqa, although the resemblance is purely coincidental. Heavy-set bathers sit with plenty of exposed flesh in the few occupied chairs, contrasting with this covered woman's slim figure. And she appears distant, lost in thought, and solitary rather than "on vacation." What is her story? Just as clouds obscure the sky and the distant hills, I will never know.